King Triton’s Palace is a 7 Bedroom, 6 Bathroom home located in Formosa Gardens Estates. The home was built in 2003 and has been renovated several times (most recently in 2017). The home features 4 king master bedrooms each with its own private bathroom and 3 themed kid bedrooms. The themed bedrooms are Toy Story, Under the Sea and Cinderella. 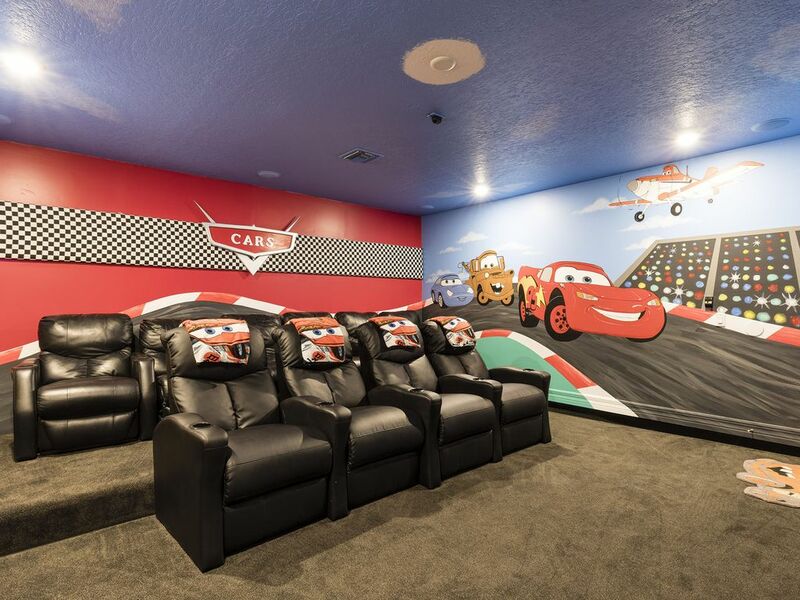 The home also features a Cars themed movie theater with theater style seating for 10. The home has a large 38 foot long, 16 foot wide heated fish shaped pool that incorporates a heated spa (the “fin” of the fish shape) and a zero entry shallow area for young children (the “tail” of the fish shape). At night turn on the color changing pool lights to enjoy the ambiance! As of April 1, 2017 we will have a brand new Under the Water Themed Splashpad! The Toy Story bedroom is located on the first floor next to the breakfast nook. Painted in vivid Toy Story colors, this room is sure to delight any young child. There is a wall size mural of Buzz Lightyear and Woody on the wall across from the bed. The furniture in this room includes two twin space ship beds. The bedding in this room is from Disney and is the ever popular Buzz Light year bedding. The adjacent bathroom next door features Marvel Avengers! Are there any Jake, Nemo or Little Mermaid fanatics in your royal family? The Under the Sea room is located on the second floor and offers children (and adults) the chance to sleep under the Sea. Jake, Nemo and Ariel and friends are painted on the wall in a room that is designed to make you feel like you are truly under the sea. The two full beds are beautiful pirate shaped themed beds with colorful bedding. The Under the Sea room offers a fully stocked bookshelf, a Netflix ready TV, and a built in closet system for maximum storage. The house has hi speed wi-fi free of charge. We provide one stroller for guest's use. Each week the house is supplied with one roll of paper towels, a small soap at each sink, two rolls of toilet paper per toilet, dish detergent, garbage bags, dishwasher detergent, counter spray and a small amount of laundry soap. I live in Cincinnati, Ohio with my husband and two kids. I manage four rental homes (three in FL and one in Hilton Head, SC). My family loves to travel to Orlando and I look forward to helping you plan your trip. We love the Orlando area and themeparks. We built this house to be able to offer our guests the same level of comfort and ammenities that we enjoy when we vacation. In our opinion, Formosa Gardens Estates is the nicest of the rental home communities in the area. The home is one of the closest homes to the Disney parks. The homes in the neighborhood are built to a high standard and offer space and comfort as your home away from home. (9) Televisions are provided in every bedroom, the family room, the theater room and outside on the pool deck. The spa is the 'fin' part of the pool. Spa heating is included in every rental. There is a washer, dryer, iron, and ironing board on the first floor. This villa is non-smoking; however, ash trays are provided on the patio for your use. No pets allowed. Pool heating is available upon request. We have a 24-hour management company in case you encounter any problems with your stay. Further, we are fully licensed and registered with state and county officials. Our home is maintained with cleaning, pest control, landscaping, and pool services regularly. Golf: For your comfort, each bedroom is equipped with a ceiling fan. All of the closets have been customized by Closet Master with built in closets for the utmost in storage and convenience. Our house was designed with families in mind. This stunning home has a south facing deck and a huge swimming pool (38 feet long x 16 feet wide) including a large swimming area, a baby area, and a heated spa (heats to 102 degrees). Just off the pool deck is a brand new, private, wooden swing set featuring three swings (one baby), a slide, and some room to climb. Following the theme of King Triton's Palace, the swimming pool is shaped like a fish. The fin of the fish is the spa, the body of the fish is the main pool (3 to 5 feet deep) and the tail of the fish is a toddler wading area (gradual slope from 2 - 12 inches deep). The swimming pool and spa also have fiber optic lighting for your own private 'light show!' Surrounding the pool is a large deck area equipped with a gas barbecue grill, a covered lanai, and plenty of lounge chairs. The deck area also has three tables and chairs for outdoor dining. Child safe door alarms are provided for safety. Your family will also enjoy the other areas in the home including a large family room, a game room in the garage, dining room, and fully-equipped kitchen. The family room offers a big screen TV, DVD player, and stereo. For those who enjoy surfing the web or need to catch up on work, our house offers free wireless Internet access (Turbo speed).